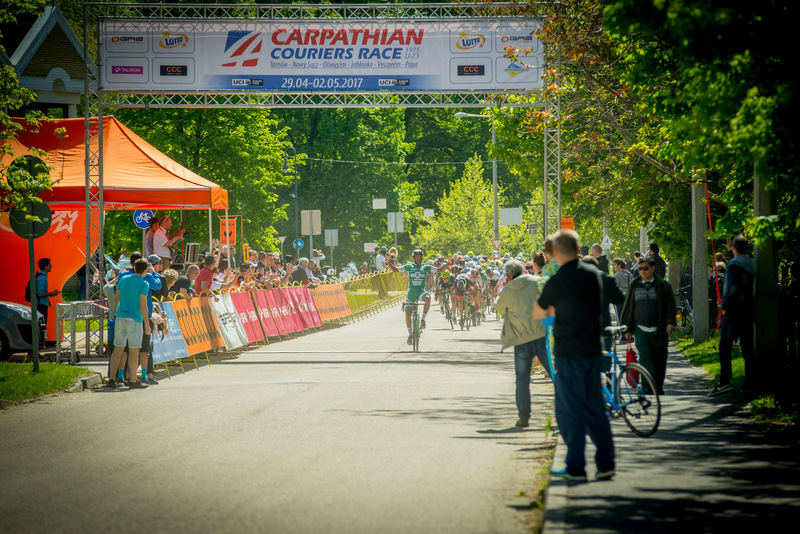 Kamil Małecki (Polish National Team) sprinted to victory on stage 2 of Carpathian Couriers Race, throwing his hat in the ring of the general classification. 21-year-old crossed the line in Jabłonka ahead of Dutchman Bas van der Kooij (Destil-Jo Piels) and Italian Raffaele Radice (Delio Gallina Colosio), and moved into 2nd overall, with just one stage to go. “I knew that if I make it over the big climb in the first group, I can have a chance. Gracjan Szeląg helped me a lot. When we saw Konwa and Pogacar at front, I asked him to put on the pressure. There were counterattacks but I couldn’t get involved, I was waiting for the sprint and I was saving the legs, I knew they won’t let anyone go” – Małecki said after the podium ceremony. Polish rider, member of CCC Sprandi Polkowice ProContinental squad, is now 2nd overall and will be looking to launch the assault on the yellow jersey. Italy’s Alessandro Pessot (Cycling team Friuli) crossed the line in 6th place and retained the overall lead by a margin of only two seconds. “The day was very hard. I had a really good team, there was not much of collaboration, so we were at the front of the race most of the time. Rog – Ljubljana were active and attacked me on the last climb. Podgacar was so strong there. I had two teammates in the first group, and we made it over together and came back. They helped me so much” – smiling Italian said. Pessot, stage 1 winner, tomorrow faces a task of defending the narrow lead on the flatish roads of Hungary, where a bunch sprint in Papa is expected to decide the general classification. 106 kilometers stage from Oświęcim to border town Jabłonka was designed as a queen stage, with three climbs awaiting the peloton. 96 riders made a start on a sunny day, heading south, towards Slovakian border. 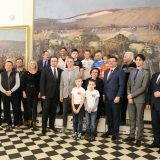 Jordi Van Loon (Destil – Jo Piels), Fernando Augusto Finkle (Guerciotti Redondela), Youri Van Iersel (WV De Jonge Renner), Joep Steinbusch (Wielerploeg Groot Amsterdam) and Tobiasz Pawlak (KK Tarnovia Tarnowo Podgórne) managed to form the break of the day after 20 kilometers and quickly gained a minute over the bunch led by Cycling Team Friuli. Philip Weber (LKT Team Brandenburg) and Viktor Filutas (Mugen Race Team Veloki) missed the move but refused to give up and launched a pursuit. Filutas climbed impeccably and made it across on his own, making it a break of six. Meanwhile attacks came from Dawid Adamczyk (TC Chrobry Scott Głogów) and Raffaele Radice (Delio Gallina Colosio) – both joining Weber in no man’s land – as the gap went up to 2 minutes. Filutas clearly felt good on the climbs and took points atop Łękawica and Przysłop, winning the intermediate finish in the meantime. Hungarian charge was stopped only at the bottom of Przełęcz Krowiarki – 14 kilometers long climb – race’s highest point and final obstacle of the day. With gradient going up, the attacks started. Piotr Konwa (TC Chrobry Scott Głogów) made it across to the breakaway, with two ISD Jorbi riders following. Slovenian Tadej Pogacar (Rog – Ljubljana) also decided to showcase his climbing skills and attacked from the bottom, quickly joining Konwa at the front. The duo quickly dropped Filippo Tagliani (Delio Gallina Colosio) and Anatoliy Budyak (ISD-Jorbi), commencing the surge for the win and holding a gap of 30 seconds on the first chasing group. Polish National Team and Team Friuli worked to close it down but Pogacar and Konwa pushed the pace and managed to start the final descent with a small advantage. The duo rode their lungs out for the win but couldn’t hold off the chasers and was caught with 7 kilometers to go. While attacks followed, a select bunch sprint decided the winner and Kamil Małecki sprinted to the victory, edging out Bas van der Kooij of Destil – Jo Piels and crowning his team’s efforts.